Yellowcake, or uranium ore concentrate (UOC), is the first link in the chain representing the nuclear fuel cycle. It also enjoys notoriety and journalists assigned to write about it may face strong headwinds of uncertainty as they try to navigate the story. In 2002 the claim Saddam Hussein was attempting to purchase yellowcake from Niger served as a key justification for the invasion of Iraq. The document circulated to substantiate the claim was discovered to be the clumsy work of a counterfeiter and yellowcake entered the lexicon of nuclear terms familiar to the public. 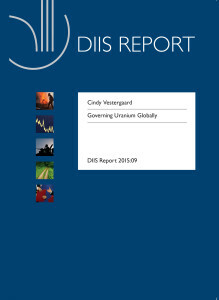 Governing Uranium, a project led by the Danish Institute for International Studies (DIIS) offers a bona fide global plateful of yellowcake, its production, processing and transport in 15 uranium producing and consuming countries. The study, authored by Cindy Vestergard, covers 85 percent of global production and 70 percent of consumption. Its focus is on security, safeguards, & industry practices that govern natural uranium production and trade – up to the point where yellowcake is converted by a chemical process into uranium hexafluoride UF6. Among findings is that while the uranium market is global export controls and nuclear security remain local. Journalists assigned to write about uranium, or the front end of the fuel cycle will find the study illuminating.